On Monday October 19, 1987, markets crashed around the globe, starting in Hong Kong, then Europe, then America. The US stock market fell nearly 23% that single day. In the aftermath the phrase “Cash is King” was originated to stress the importance of holding low-risk investments. Unfortunately, this catchy phrase continues to be used today. I say unfortunately, because holding cash (for all but the uber-wealthy) is a losing strategy for two simple reasons. First, if the idea is to hold cash until “markets settle down,” “become more attractive,” or, Heaven forbid, “the markets crash,” then the investor is playing the fool’s game of timing the market. Countless academic studies show (and I have argued many times before) that no one can predict where markets are heading in the short to medium term. 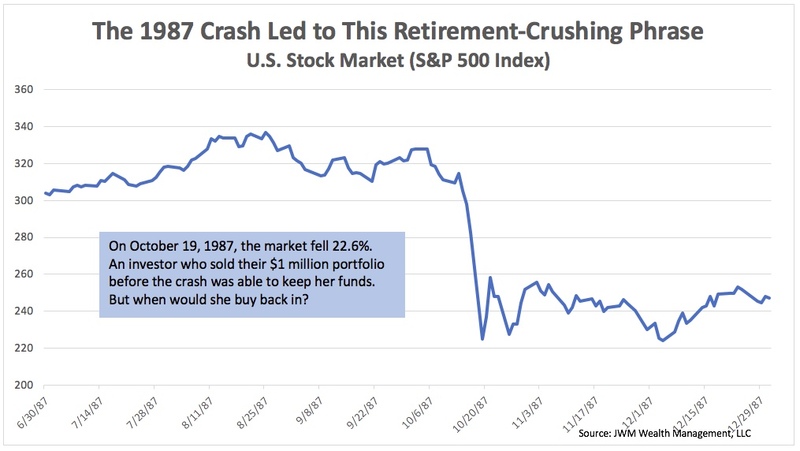 So, while she waits for “a better entry point,” the markets are likely to drift up, up and away as so many have discovered after moving to cash in 2009 quite nearly at the bottom. Second, if the idea is that cash is best over the long-run we need only to know that governments print money each year to see how this is unwise. Because the supply of money increases, the value of money must decrease each year. We quantify this by measuring inflation, and it’s no small matter. What looks safe today only guarantees poverty tomorrow. Now, cash isn’t all bad. In fact, I regularly recommend large cash holdings for my clients, but only as part of their comprehensive plan. You see, understanding that we can’t predict short-term market movements means we shouldn’t invest for the short term. But quite often we will have the need to use our funds in the short term, say for college tuition, upcoming retirement, or taking a once-in-a-lifetime trip. A good starting point is to set aside any net funds needed over the next 5 years in a savings or other cash account so we know we have the money to do what we want in that period, regardless what the markets do. Not only does this allow us to meet this upcoming need, but when the inevitable crash comes, we can feel confident that it won’t affect our upcoming financial plans! One other note. Going back to the origination of the phrase, it is important to understand that it came about only after the markets crashed. Everybody seems to be an expert after the fact! I’d rather plan before the event! Got a question or want to continue this discussion? Use the form below and I will respond to you personally!